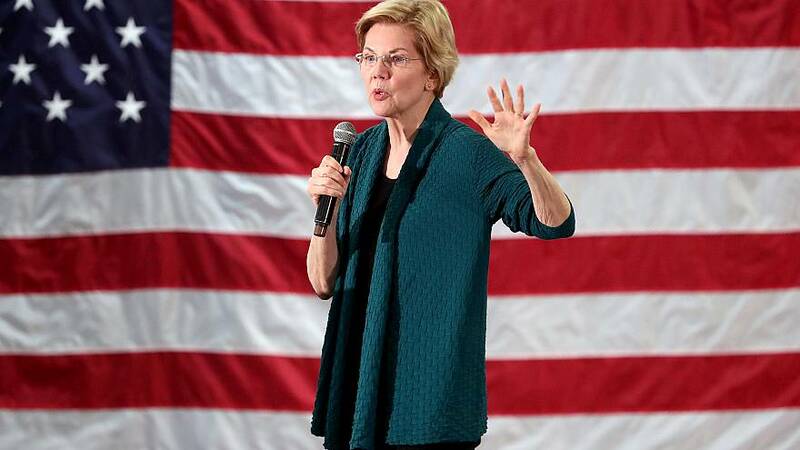 WASHINGTON — Democratic presidential contender Sen. Elizabeth Warren, D-Mass., on Friday called for a significant change to Senate rules whenever Democrats retake control of the upper chamber: eliminating the filibuster for legislation. Warren, ahead of her planned speech to the National Action Network conference, tweeted that the filibuster "has been used to block progress, and in recent years, obstruction in the Senate has only gotten worse. We're fighting for big, structural change—but we won't get anything done unless we face this head on." "I've watched Republicans abuse the rules when they're out of power, then turn around and blow off the rules when they're in power. We just saw it happen again this week when they unilaterally changed the same rules they abused to ram through President Trump's extreme nominees," she wrote. She added, "We're done with having two sets of rules. When Democrats have the White House again, if Mitch McConnell continues to put small-minded partisanship ahead of solving the massive problems facing our country, then we should get rid of the filibuster." Doing so would lower the threshold to pass pieces of legislation from 60 votes to a simple majority, or 51 votes. According to excerpts of her planned remarks released by her presidential campaign Friday morning, Warren will echo this idea in her speech to the NAN, a civil rights organization founded by Rev. Al Sharpton, who hosts "PoliticsNation" on MSNBC. Warren's announcement comes just two days after Senate Republicans invoked the "nuclear option" to limit debate time on certain nominees, which they did in order to speed up confirmations. It's also one of perhaps few issues on which she and President Donald Trump seem to agree. Throughout his time in office, Trump has repeatedly urged Senate Majority Leader Mitch McConnell, R-Ky., to eliminate the filibuster for legislation. McConnell has rejected that idea, arguing that it's the only procedural rule that is intended to force bipartisanship on legislation. "The legislative filibuster is central to the nature of the Senate. It has always been, and must always be, the distinctive quality of this institution," McConnell said on the Senate floor Wednesday. "In the United States Senate, dissenting voices retain considerable power to shape the debate on legislation." McConnell argued that the rules change he pushed through Wednesday is different than changing the rules on legislation. Only the budget reconciliation process allows the Senate to pass certain pieces of legislation with a simply majority vote instead of 60, which Senate Republicans relied on to pass their tax overhaul package in 2017. Trump called on Republicans that year to eliminate the filibuster for all other bills after they failed to use budget reconciliation to pass an Obamacare repeal measure. McConnell did nuke the filibuster in 2017 for Supreme Court nominations in order to confirm Neil Gorsuch as a Supreme Court justice, a rules change that also helped Republicans confirm Brett Kavanaugh to the high court last year. But getting rid of it for legislation would have even larger implications. Washington Gov. Jay Inslee, who's also running for the Democratic nomination in 2020, has also called for eliminating the filibuster, but he and Warren may be in the minority. In 2017, 61 senators signed a letter saying that they opposed changing the filibuster for legislation from 60 to 51 votes. The 2020 Democratic contenders who signed the letter at the time were Sens. Amy Klobuchar, D-Minn., Kirsten Gillibrand, D-N.Y., Kamala Harris, D-California, and Cory Booker, D-N.J. The two 2020 Democratic candidates who did not sign it were Warren and Sen. Bernie Sanders, D-Vt.
At a recent forum in Washington, D.C., Booker defended the filibuster and Gillibrand also expressed concerns, but didn't rule it out altogether, saying she "will absolutely consider this issue," if elected president, but warned that "we have a risk that if you are for this today, it may be done before you have the majority." Democrats made the first major Senate rules change since 1975 when they invoked the nuclear option in 2013 and eliminated the filibuster for most presidential nominations, except for the Supreme Court.